Driving in Rochester/Syracuse snow tomorrow (Wednesday)? A relative of mine passed away in Wolcott, NY, a town roughly halfway between Rochester and Syracuse near Lake Ontario. I had planned to drive to my hometown of Williamsport tonight, stay over, and drive to Wolcott tomorrow morning. But I’m having second thoughts—considering that a band of snowstorms is expected to pass through the region this evening through Thursday. It looks as if the bulk of the snow (7-10") will fall by 8 a.m. tomorrow. I’d be hitting the region around 11 a.m.-noon. And the snowfall is expected to cease until around 5 p.m.—by which time I’d be back on the road headed for PA. One caveat is that wind gusts are expected to be 30+ MPH, so blowing and drifting snow will be an issue. My understanding is that no significant snowfall is expected elsewhere along my route. Once I’m south of the Finger Lakes area, I should be in the clear. I’ve not driven in upstate NY during a snow event, but I have a tendency to assume that the region’s NYSDOT and NYSTA crews are so accustomed to such heavy snowfalls that roads would be at least passable by my scheduled arrival (if I’m very careful). Or am I being overly optimistic? The most direct route would likely via US 15 and NY 414, but would the more roundabout I-86/I-390/I-90 route be advisable instead? Also, I might be able to swap my FWD VW Golf for my dad’s AWD Subaru Impreza—I assume a must if I’m going to attempt this. I think I’ll head to Williamsport tonight and check Rochester-area reports before committing to make the remainder of the trip. But any input that those of you who are more familiar with the area can provide would be appreciated. Re: Driving in Rochester/Syracuse snow tomorrow (Wednesday)? Check the latest forecast. Metro Detroit radio on the way home tonight said it was going to start mid-morning on Wed. It's coming from the NW, so it should get to NY later, methinks. Wolcott is pretty much in this round of Lake Ontario Lake Effect...so the higher amounts will definitely be there...it looks like overall 6-16 inches over the next 24 hrs, which isn't brutal - average less than 1 inch per hr. It's the snowfall rate that you need to pay attention to. NYS DOT is very good at handling 1 in per hr, but anything 2 in or more, and it's hard for anyone to really keep up everywhere. NY 104 is the main road in Wayne County, so that will get the most attention. Also keep in mind the temps...road salt starts to lose it's effectiveness < 20 degrees, so that will be a factor. Besides the snowfall rates, the issue with blowing snow is visibility...so as long as you stay focused and keep your distance, you can start to predict areas with open fields being possibilities for blowing snow, so just keep aware and you should be fine. NY 414 has some pretty good sized hills around Watkins Glen, but they're far enough away from the lake that it shouldn't be an issue. And it sounds like the worst of things should be over by then. If you can take the Subaru, do that, and then I'd probably attempt NY 414. My choices would be either US 15 to NY 414, or US 15 to I-86 to I-390 all the way to Rochester, then I-590/NY 590 to NY 104. I wouldn't consider the Thruway; there's no real advantage to that. The issues will be north of the Thruway, so your real decision is whether you want to take NY 414 north of the Thruway, or come in from the west in NY 104. NY 104 (and 390/590) is definitely the more major route vs NY 414, but you'll be driving parallel to the snowbands, so you'll be in them longer vs coming from the south. I lived in Rochester 2008-2016 and owned a Subaru most of that time and never had an issue. Follow your normal snow driving techniques...no over-accelerating, braking, or steering, keep your distance but keep your momentum. Thanks for the perspective, both of you. I’ve been checking the forecasts, and they seem to be maintaining that the heavy snow should be done by about 6-7 a.m. and tapered off to showers by 8. Accumulation amounts seem to have been adjusted down to about 3-5 inches overnight and less than one additional tomorrow during daylight hours. So I’m feeling increasingly confident that I can handle it without too much difficulty. I will be swapping my car for the Subaru tomorrow, so I will have AWD after all. I’m not sure why I suggest I-90 in my original post—perhaps just due to my relative unfamiliarity with the area and the vague sense that “somewhere between Rochester and Syracuse” = “somewhere along the Thruway”. I’m gravitating toward the NY 414 route since the Finger Lakes area and further south should be relatively clear. I’ll check conditions before I leave, though. For weather forecasts, don't rely on just weather.com; they don't really accurately forecast some of the lake-effect nuances. See if you can find a website of a local news station out of either Rochester or Oswego. More of their forecasts for lake effect use the local E/W highways as boundaries...so...lake effect could effect north of 104, or north of the Thruway, or north of 5/20. It looks like the worst of this is labeled as north of 104...so...with AWD, I think you'll be pretty safe taking NY 414 instead of heading west to I-390. And...even with the worst-case forecasts I've seen, this is still NOT a major lake effect situation...so...they aren't talking FEET of snow...just up to a foot very worst case...so you should be fine. That's been my go-to online site...they're quite good. Thanks for the weather resource! Their report also seems to suggest this won’t be the major event I feared—of if there is significant snow, it should be mostly confined to the last few miles. Of course I’ll still leave myself plenty of extra time and drive with abundant caution. One last minor tip - the route I would take is US 15 -> NY 414 (short jog on I-86 East needed) to Watkins Glen, and then stay on NY 14 north all the way to NY 104 in Sodus, then take your jog east to Wolcott. NY 14 north of Watkins Glen is slightly faster (and IMO more scenic) than NY 414...it'll save 5 or 10 min. Had a roommate from Wolcott when I was in college in Idaho. Thanks for the tip. I didn’t see this until after I returned to Williamsport, but coincidentally, that is the route I used for my return trip. Ironically, even though Rand McNally marks NY 414 with “scenic route” dots (and not NY 14), I thought NY 14 was more scenic. The weather and road conditions were completely clear from Williamsport up through Corning. Winds seemed to intensify north of there, and from Corning most of the way to Seneca Falls, I faced patches of blown snow, but little to no new snow was falling. 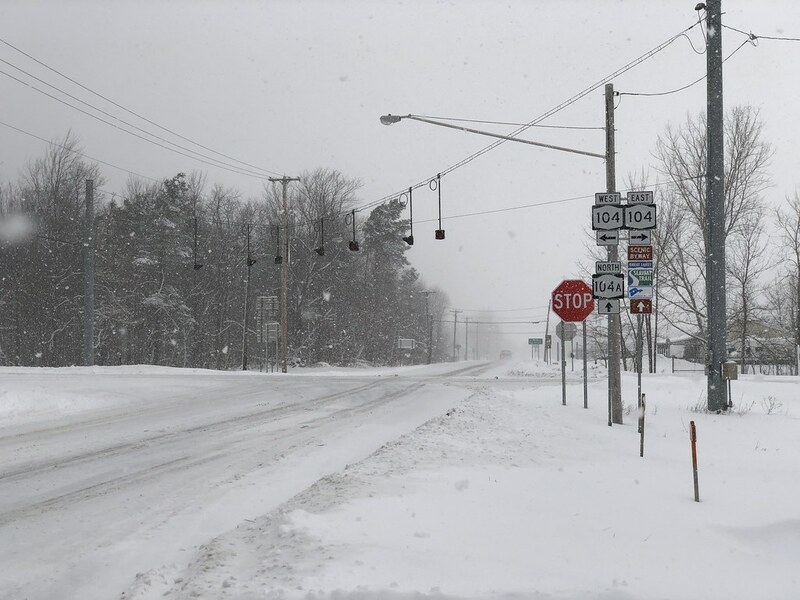 Approaching Seneca Falls, spotty snow showers fairly quickly transitioned to a steady snowfall; then conditions rapidly deteriorated north of the Thruway. But the roads I traveled were never impassible, and I surely could have even completed the trip in my Golf (though I was glad to have the extra security of AWD). There were a few white-knuckle moments when passing trucks created momentary white outs or when I could sense the car was beginning to slide, but I made it through without incident. Thanks again, everyone, for your input!